For many low- and middle-income countries (LMICs), expanding health coverage to informal workers is one of the most common, yet complex challenges requiring action. Informal workers are, by definition, not provided with legal or social protections through their employment, and are vulnerable to health and economic shocks. They also account for a large percentage of the population in LMICs. Expanding or deepening health coverage to informal workers is thus an area of interest for stakeholders pursuing universal health coverage (UHC): the goal that the entire population can access needed good-quality care without risk of impoverishment. Pro-poor coverage schemes that rely on prepayment – payment delinked from the time of care seeking – are a key financing strategy for UHC (WHO 2010). However, including informal workers in such schemes is challenging given that informal workers are not typically registered in taxation systems and social protection systems, nor covered by labor laws and regulations, making them less visible to the government and other stakeholders (Rockefeller Foundation 2013). 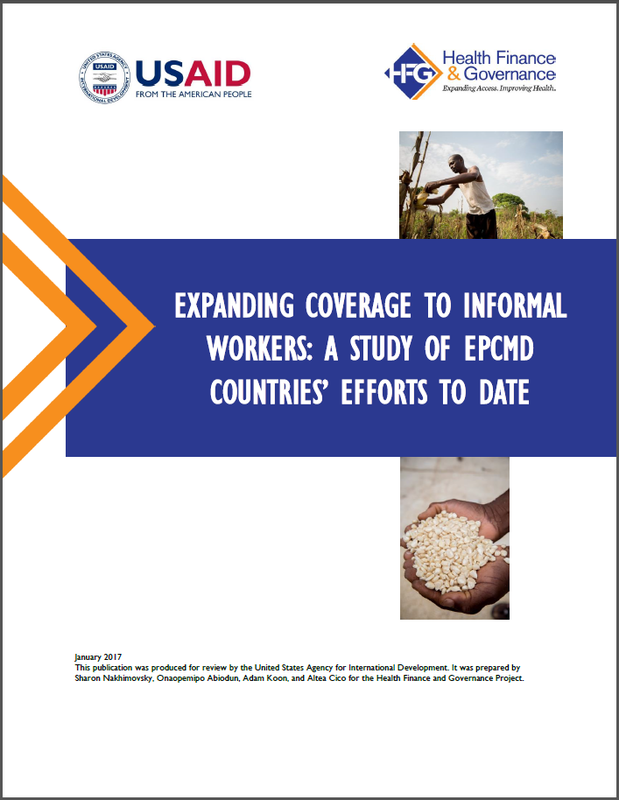 This report complements existing literature on how health reforms can improve the welfare of informal workers, focusing on the 25 countries prioritized for development assistance by the United States Agency for International Development (USAID) as part of its Ending Preventable Child and Maternal Deaths (EPCMD) initiative. Given the strong interest in these questions among EPCMD countries, USAID commissioned the Health Finance and Governance project (HFG) to conduct this research and provide recommendations relevant to UHC policy discussions in these countries.